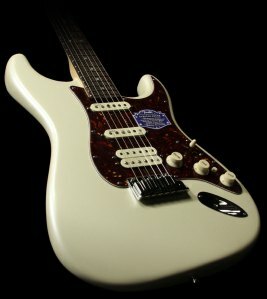 In the old days guitars had either humbuckers or single coils but somewhere around the 80’s we saw the growth in popularity of blending of humbuckers and single coil pickups in the same guitar. This had many advantages for the working guitarist, most notably the ability to bring a single axe to a gig and get all the required tones! Of course with that advantage came a new dilemma with regards to pot value. If one selects 250K pots, the single coils will sound right, but the humbucker will be a bit too dark. If however one selects 500K pots, the humbucker will sound right, but the single coils will sound too bright. This then begs the question: Can we dynamically fake out the pickups in such a way that the humbucker will see 500K pots and the single coil pickups will see 250K pots. To accomplish this, we either need to dynamically increase the value of a 250K pot or decrease the value of a 500K pot. Well, there is no way to dynamically “increase” the resistance of a pot past its maximum, but there certainly is an easy way to decrease its resistance. As a pre-requisite to understanding this, one must know a simple formula for resistors in parallel. The math becomes really easy if the value of R1 and R2 are identical. R-total then is simply 1/2 the value of R1 (or R2). For example, if we have two resistors each with a value of 220K, then putting those 2 resistors in parallel will yield 110K. Simple. I bet you can see where I’m going with this! If you put a 500K resistor in parallel with a 500K pot, the resulting resistance will be 250K ! Now, 500K is not a very common value for a fixed resistor, but the closest common value is 470K. So an easy thing to do with readily available parts is to to put a 470K fixed resistor in parallel with the 500K pot, which will yield approximately 242K in resistance, which for all intents and purposes is close enough to 250K (close enough for Rock-N-Roll as they say). The trick is to do this ONLY when the 5 way switch has selected the single coil pickups, and NOT when the 5 way switch is pointing towards the humbucker. To achieve this, one must use a multi-pole 5 way switch, commonly referred to as a “super switch”. The wiring diagram we have posted below is based upon Fender Lonestar wiring, with the added twist of employing this mod where the humbucker sees 500K and single coils see 250K. This is the exact same setup we offer in one of our Prewired Strat Assemblies which we refer to as “Smart Lonestar.” If you are not familiar with Fender Lonestar wiring, a 5 way super switch is employed to “auto tap” the humbucker when in position 2. The super switch is also used to assign a 500K tone pot with a .022 uf cap to position 1 (bridge pickup), and a 250K tone pot with a .047 uf cap to positions 2-5 (for the single coils). Below you will find our mod which takes it one step farther by putting employing a 470K resistor in parallel with the volume pot for positions 2-5. Note: we use two 470K resistors, one for positions 2- 4 and another for position 5. The only reason this was done, was so as to integrate the mod into existing Lonestar wiring without changing any of the standard control function.